Beautiful, unique, exquisite...these are just a few of the words that describe the jewelry you will find at Jason's The Art of Jewelry, located in Burlington, NC. Others are excellent customer service and great staff with many years of experience. Whether you are shopping for diamond engagement rings or fashion jewelry from names like Spark Creation, Honora, Gottlieb & Sons, Colore and Belle Etoile. Jason's has a selection to fit your style. You will find jewelry normally found in larger markets coupled with the best in local, personal care. Other jewelry services include professional jewelry repair, custom designing, insurance & estate appraisals and cash for your unwanted gold items. 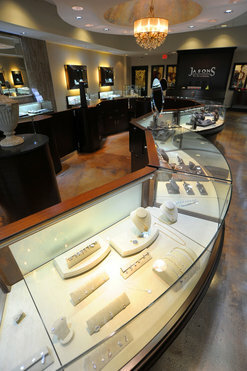 Jason Litten, owner of the business, has 30 years in the fine jewelry industry. A GIA Graduate Jeweler, Jason and his staff look forward to making your every purchase worthy of a celebration!